Pressure rising on teachers, unions warn. Critical underfunding in the region’s schools is cutting to the bone, headteachers have warned, with tough decisions having to be made over staffing and support levels. When school budget pressures rise, said Anne Swift, a former Scarborough headteacher and former president of the National Union of Teachers, the first people to go are support staff. And while parents might not notice, she adds, the teacher certainly does, with the result being rising pressures and workloads. “Teaching is becoming more and more stressful, with fewer people on the workforce to do the work in the first place,” said Ms Swift. “It means we see whole departments dissolve. Arts, drama, music, they are disappearing across the curriculum. The latest Government school census figures, based on data collected in November, considered teacher numbers, staffing rates, and student to teacher ratios. As well as the loss of nearly 400 teacher and teaching assistant posts, 438 auxiliary jobs were lost in Yorkshire and the Humber last year, in roles such as technicians, counsellors and administrators. And with just 15 per cent of the region’s teachers aged over 50, Ms Swift says, there are challenges over experienced, long serving staff. Increasingly, she warns, schools are turning to parents to support and pay for ‘extra’ provision, such as class trips or events. And while the latest Government census figures show primary school pupil numbers are evening out, a bulge is now beginning to reach secondary. “That’s putting increasing pressure on schools,” she said. “In the north, and in particularly in rural areas, the underfunding is really hitting rural schools and small secondaries. “A lot of education authorities are underfunded, particularly in rural areas - it’s a double whammy to authorities in the north. “Schools have been desperately hanging on to try and provide a curriculum for children but they are now having to cut to the bone. They are having to make very hard decisions. Across the region, the census figures varied widely, with as many as 390 staff jobs lost at schools in Calderdale, compared to just one overall in Leeds. But the authority still faces challenges, the city council’s executive member for learning has warned, with many teachers leaving industry altogether as they face mounting pressures. Coun Jonathan Pryor, warning the profession is becoming less attractive, said there have been rapid changes in Government policy. “Some of the pressures that teachers are under has left many deciding to leave the profession, or take early retirement,” he said. “That is putting so much pressure on teachers and many are asking why they are carrying on when there are easier jobs. “We work hard with teachers to support them, but it’s a difficult profession. Geoff Barton, of the Association of School and College Leaders, cited figures from the Institute for Fiscal Studies which this week found that school funding per pupil has fallen by eight per cent in real terms over the past eight years. “This has resulted in staffing reductions in many schools,” he said. “In addition, the Government has failed to achieve targets for recruiting secondary school trainee teachers for the past five years in a row, and we are losing too many teachers because of workload pressures driven largely by the excessive volume of government reforms in recent years. “As a result of these factors, the number of teachers fell in 2017 even though the number of pupils increased. “Pupil-to-teacher ratios have risen over the past three years and so have average class sizes in secondary schools. Authorities across the region saw huge variance in vacancy rates and the numbers of staff jobs lost last year. In Calderdale, figures show that as many as 390 staff roles were lost in the area’s schools between November 2016 and 2017, while in Leeds that figure overall was just one. 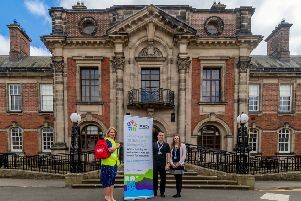 “Calderdale Council is regarded as a high performing authority in the region, for the academic progress its children and young people make,” a spokesman said. Bradford lost the second highest number of staff posts for the whole of the region. Acknowledging a challenge in attracting and retaining teachers, Michael Jameson, strategic director of children’s services, said the authority had taken strong action and was confident of improvements: “Teaching is one of the most rewarding professions, but is demanding and schools across the whole of the UK can face challenges in recruiting and retaining teaching staff. The authority is working closely with schools, investing heavily in training of teachers and school leaders as well as taking active steps to recruit talented teachers. “We know this is making a difference as our latest figures show more teachers are staying in Bradford, with numbers of teachers leaving the profession for non-natural reason falling from 14.7 per cent in 2015/16 to 12.3 per cent in 2016/17,” said Mr Jameson. There are scholarships, a dedicated recruitment and retention officer, a new research school, packages of support, and a campaign encouraging people to find out about training and employment options. The Department for Education, citing figures from the Institute of Fiscal Studies, said real terms per pupil funding in 2020 will be more than 50 per cent higher than it was in 2000, while 32,000 trainee teachers were recruited last year. Teacher levels remain high, a spokesman stressed, while school funding is at its highest ever level, rising to £43.5bn by 2010.